The simple answer would be, it’s an interactive tool for quick and easy online/offline configuration of a VLT® drive or soft starter using a PC. You can also use the tool to configure the communication network and to back up all your relevant parameter settings. 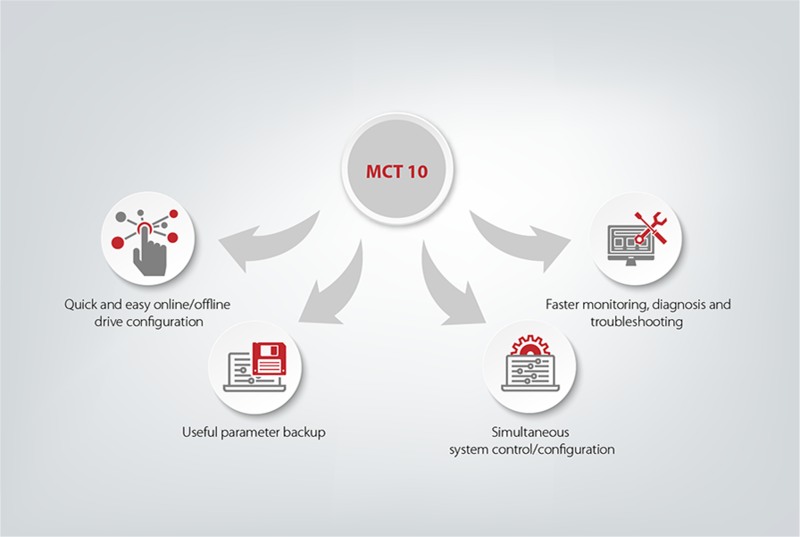 With MCT 10, you can control and configure your system simultaneously and monitor your entire system more effectively for faster monitoring, diagnosis, troubleshooting (alarms/warnings) and better preventive maintenance. The next question would be, are you aware the tool comes in three different levels and do you know what each level offers? The first two levels are Basic and Advanced. -The Basic version allows you to create only four drives in the project, whereas the Advanced version allows 127 drives to be created in the project. -Scoping is only available through two channels in the Basic version. This increases to eight channels in the Advanced version. -Real-time logging is not available in the Basic version, but is available through four channels in the Advanced version. -The Functional safety configuration plugin, for graphically configuring the functional safety option, is only supported in the Advanced version. -The Advanced version also provides access to the Drive files system so that you can update the Drive and Option firmware. More information on feature compatibility with specific drives and drive firmware can be found in the following video. OK, so you might already know these things about MCT 10. But did you know that version 4.00 of the tool has now been released, and that it includes even more features that enhance usability? Amongst the many new features, the most important are the new Status plug-in and the new Motor plug-in. Status plug-in: we have greatly improved the user friendliness of the readouts for various status and control words, relay inputs and outputs that are available over the fieldbus. The original hex values (0x) have been ‘translated’ into a graphical representation. We have combined them into a single plug-in that shows you much more information. You’ll be able to see right away if a certain relay or bit is on or off, and what exact command the drive has been configured with. It’s a huge time saver as there’s no longer the need to find the manual and translate the hex value first. We spoke before about MCT 10’s three different levels. Arguably the biggest addition to MCT 10 V4.00 is the third level – VLT® Software Customizer. As the name suggests, VLT® Software Customizer allows you to customize the commissioning experience of the VLT® to best fit your needs. It is a strong tool that enables you to quickly create your setup and test it first to MCT 10 using the simulator before uploading it to a real drive. SplashScreen allows you to create a custom splash screen for when the drive starts up. You can use the built-in editor to create an image from blank or import an existing image from a library or from your computer and adapt it to the VLT®. InitialValues allows you to set a new default value for virtually any parameter. SmartStart allows you to create a custom start-up wizard to go through exactly the parameters you need. How can I install MCT 10? To install the Advanced or Software-customizer level, click here to contact your local Danfoss Drives representative to receive your license. If you have any questions about the MCT 10 or need further support, don’t hesitate to contact us using the Comments box below. We’re here to help. I am looking to use the MCT 10 software to setup a few drives to communicate with an external PLC over Modbus RTU. Is it possible to use the MCT 10 software over the RS485 to change the FC port settings on a VLT FCM106 drive away from default baudrate and over to Modbus RTU protocol? Or will this simultaneously corrupt any future attempts of communication between MCT 10 software and drive? when you are communicating over serial then the protocol parameter is read-only. So for FCM106 the protocol parameter is actually always read-only in MCT10. Scanning bus for active drives..
1 drive(s) responded to scan. So that we can analyze and support you better to resolve the issue. I assume you are trying to scan VLT5000 using the SerialAuCom bus node. Could you create a SerialFC Fieldbus, configure it and then scan for the VLT drive. I have exactly the same problem. Has a solution already been found? I want to upgrade the firmware of my FC 302 drive running 6.44 at the time. I have the the drive software upgrader enabled, but I could not find any source for the firmware file. Where can I get the new firmware file for my drive? What are the perquisites to run it with vlt 5000 series? For the Advanced level, you need to contact your local Danfoss Drives representative to receive your license. Here is the link to find your local representative http://drives.danfoss.com/danfoss-drives/sales-offices/#/. I tried to install the advanced vers. but failed to link. Can you help me? Hi Liang, send me a mail with detailed information on the advanced version installation issue, i shall support you.